I am interested in everyone's opinion on including Rommel's scenario vehicles in the platoon builder. 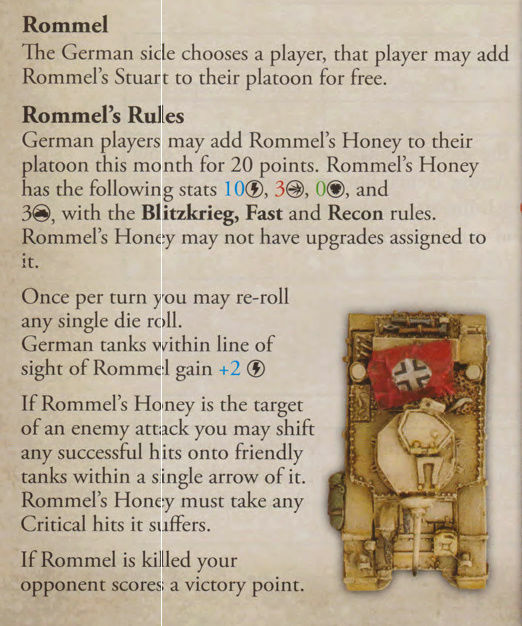 It sure would be handy for desert scenario builds to be able to include the Dorchester Command vehicle, Grief and Rommel's Honey in the build list. On the other hand, he was created for 3 specific desert scenarios and including them in the Platoon builder might be misleading or even disqualify a player from a tournament. How about including them, but with an explanation in the entry itself, that this particular vehicle can be only used, if agreed by the opponent? Noticed a typo on Deadly Gunner. If this tank scres any uncanceled Critical Hits, you may exchange one Critical Hit for two Hits. Thanks.....will get done it soon. 1 user thanked Ober999 for this useful post.